Sound Watershed Consulting is supporting the Friends of Squaw Creek in a project that is refining several conceptual restoration alternatives along a sensitive sub-alpine meadow with significant historic and current land-use impacts. Squaw Creek has been extensively degraded due to numerous land-use impacts. Past erosion control efforts have experienced mixed success. Project goals are to restore eco-geomorphic functions by identifying restoration opportunities and constraints and developing alternatives that meet ecological, economic, social and political objectives. Design solutions for the site includes an integrated set of features designed to improve floodplain interactions, restore bank stability, and regulate natural sediment loads in a manner that is consistent with a dynamically stable channel system. The Project is ramping up for Phase 3 - Preliminary Design and CEQA. We've been awarded a SWRCB 319(h) Grant that should be available in early 2011, and we have some initial funding from Placer County and the Lahontan RWQCB to complete some technical sub-tasks. We also have an outstanding Grant applications to complete our funding needs. The project enjoys broad support by a diverse group of landowners, residents, stream restoration experts and agencies. Sound Watershed provided a Primer on Collaborative Stakeholder Processes based on our experience with numerous other multi-stakeholder forums. These ideas are intended to support the Friends of Squaw Creek in its effort to formally organize, but are relevant to any multi-stakeholder process. Below is a summary of slides presented during Sound Watershed's project status update at the October 14, 2009 Friends of Squaw Creek Meeting. It outlines the project milestones to date, and outlines potential future scope of work tasks (and estimated costs). This was the basis for discussion for how to proceed with existing funding. The documents below outline our current thinking about the next phase of work. These have been reviewed on multiple occasions at Friends of Squaw Creek meetings, and are the basis for recent grant applications. A series of technical workshops were developed to engage input from stream restoration experts, the landowners associated with the project, and other stakeholders. The photos below provide a summary of the various alternatives under consideration. The historic channel alternative will partially restore Lower Squaw Creek by re-establishing planform geometry similar to conditions that likely existed prior to the 1800s. The desired channel configuration would be highly sinuous, low-gradient, and relatively shallow. Additional analysis tasks are being developed to extend the project area upstream to the confluence of its headwater tributaries. 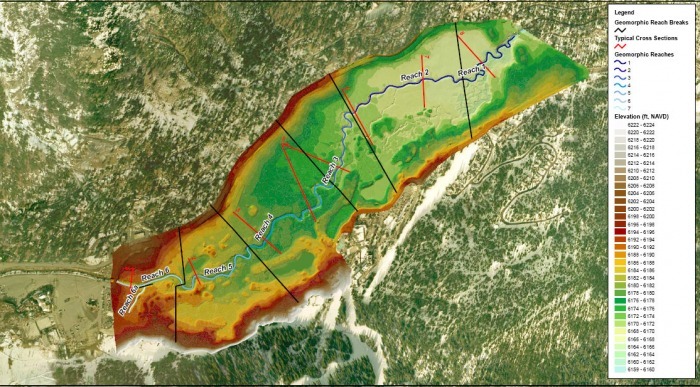 The Modified Historic Channel Alternative would restore existing historic channels, but would retain the existing mainstem channel in areas where the old channel is not clearly evident. This would take advantage of existing conditions, but would reduce the design risk associated with developing new sinuous channel(s). This design alternative for Lower Squaw Creek involves restoring habitat and functions primarily through restoring and enhancing floodplain channels. This alternative relies on bed and bank stabilization strategies and mainstem flow diversions to improve existing channel conditions, prevent encroachment on existing land use, and restore natural floodplain conditions. A fifth design alternative for Lower Squaw Creek focuses on improving the existing channel condition by preventing future bank erosion and bed incision. This alternative relies on bed and bank stabilization strategies to improve existing channel elements, prevent encroachment on existing land use, and restoration of limited habitat conditions. This image shows the existing conditions for the project area. Squaw Creek configuration during the 20th Century. Note the remnant channels along the northeastern portion of the valley. These were likely the primary channel prior to European settlement in the mid 19th Century.